US DEA admits that criminal activity in cryptocurrencies is declining as the volume increases. There are now more job opening than there are people looking for work, so aren’t wages increasing? The American 1% owed more wealth than anytime in history, we saw this during the great depression. The MSM doesn’t know what to do with the economy, they are now saying that this is Obama’s economy and Trump is riding his wave. The Fed is being brought up in the new again, there are now reports that congress should stop the Fed from destroying documents. The sale of the petro yuan has increased since the sanctions on Iran. Nunes says that Bob Ohr is going to become very important very soon. Judicial Watch wants the DOJ to make sure they keep Comey’s emails intact, according to court documents. The identity of Dianne Feinstein’s Chinese driver has been discovered, this individual is reported to be a spy. Facebook just lost a major advertiser. UK will not allow the OPCW visit certain areas where the poisoning of the Skripal’s took place. MSM is warning that something might happen to reporters. Q drops more breadcrumbs and warns that everything is about to intensify and that most of the news coming out of the MSM is fake news. Be prepared because it’s going to get a lot worse before it gets better. There was a surprising development back in June, when that month’s JOLTS report revealed a curious inflection point: for the first time in reported BLS data, the number of US job openings surpassed the number of unemployed workers. Fast forward two months, when as the BLS reported last Friday, the number of unemployed workers increased from 6.0 million to 6.3 million (after hitting 6.6 million in July). The question was whether this increase would also reverse this Opening-Unemployed trend. However, as the just released June JOLTS report revealed, for the third month in a row the number of job openings stayed above the total number of unemployed workers, as May’s 6.638MM job openings number was revised higher to 6.659MM, This means that June was the third consecutive month in which the number of job openings was higher than the number of unemployed Americans. According to the historical correlation between the number of hires and the 12 month cumulative job change (per the Establishment Survey), either the pace of hiring needs to drop, or else the number of new jobs will rise significantly in the coming months. The gap between the rich and the poor in America has ballooned over the last several decades. In 2015, the top 1% of Americans made 26.3 times as much income as the bottom 99 percent – an increase from 2013, when they earned 25.3 times as much, according to a recent study released by the Economic Policy Institute, a left-leaning Washington, D.C. think tank. A family needed an annual income of $421,926 to be part of the 1% nationally, the study said, but in some states the threshold was higher. The top 1% of Americans took home more than 22% of all income in 2015, the study found. That’s the highest share since a peak of 23.9% just before the Great Depression in 1928.
. The incomes of the top 1% grew faster than the bottom 99% in 43 states between 2009 and 2015. In nine states in the U.S., the top 1% represents more than half of all income growth. Meanwhile, the median net worth of Americans currently hovers at $68,828 per household. One in five Americans say they have more credit-card debt than they do in emergency savings and less than 40% of Americans say they have enough savings to cover a $1,000 emergency room visit or car repair. Sen. Rand Paul (R., Ky.) still hasn’t persuaded his colleagues to audit the Federal Reserve’s conduct of monetary policy. Perhaps lawmakers could simply agree that the Fed should stop destroying documents. Chinese oil futures contracts denominated in yuan hit their daily limit with a 5-percent spike on Tuesday as the US kicked off the first round of sanctions against Iran. Washington’s decision to withdraw from the Iran nuclear deal and target the country’s oil sector with sanctions is expected to significantly boost China’s leverage to demand crude imports be priced in yuan. House Intelligence Committee Chairman Devin Nunes, R-Calif., said on Monday that Bruce Ohr, a former top official in the Justice Department, will become “more and more important” as GOP lawmakers look for evidence of power abuse and corruption at the highest levels of the Obama administration. Congressional investigators have found that Ohr, who was the fourth-highest ranking official in the Justice Department, acted as an intermediary between Steele after he was terminated as a source and the FBI’s investigation into ties between the Russians and President Trump’s 2016 campaign. When Ohr gave the bureau information from Steele, agents made a record of it, and those records are in the form of so-called 302 reports, in which the FBI agents write up notes of interviews during an investigation. The Department of Justice has been ordered by a federal court to preserve federal records from the personal email accounts of former FBI Director James Comey, following a joint motion by the Daily Caller and Judicial Watch to compel the preservation. In the motion, Judicial Watch argued that “there is reason to be concerned that the responsive records could be lost or destroyed.” Judicial Watch pointed out that in June 2018, the DOJ’s Inspector General stated, “We identified numerous instances in which Comey used a personal email account (a Gmail account) to conduct FBI business.” The Justice Department, in response to Judicial Watch’s concerns, sent Mr. Comey a letter asking him to preserve records but refused to make the letter available and opposed a preservation order. [T]he Court will allow [the DOJ] until September 28, 2018 to complete its review and release of any responsive, non-exempt records to Plaintiffs. That being said, [the DOJ] is also ORDERED to make rolling productions between today and September 28, 2018, at reasonable intervals, of any records that are reviewed and found to be responsive and non-exempt. * the Court will GRANT [Judicial Watch’s] Motion. [The DOJ] is ORDERED to take all necessary and reasonable steps to ensure that any records that are potentially responsive to either of the Plaintiffs’ FOIA requests located on former Director Comey’s personal e-mail account are preserved. BREAKING: Feinstein’s Chinese Spy Identified — ‘Russell Lowe’ — Was OFFICE MANAGER Not just a Driver — Feinstein Aide for 20 YEARS! the name of the spy tonight: Russell Lowe. Russell Lowe was Senator Feinsein’s office manager. Lowe is a Chinese-American who spent 20 years as the aide to Dianne Feinstein. Lowe worked for Feinstein while she was chair of the US Senate Intelligence Committee. Russell Lowe is now the Secretary General of the Education for Social Justice Foundation. Facebook has lost a major advertiser, UniCredit SpA, which has severed all ties alleging that the social media giant hasn’t acted ethically, “other large companies” may follow suit. The Soros-funded Media Matters group has begun actively lobbying Facebook to purge the platform of people who dare to question global warming. Detailing that the Organisation for the Prohibition of Chemical Weapons (OPCW) remit will be limited by the UK’s ‘technical assistance request,’ Anton Utkin, a former UN chemical inspector in Iraq, stated: “The UK’s desire is that OPWC confirm the chemical agent, that the UK has already identified. That means that the OPWC specialists will be limited to take only those samples that UK will allow, they will interview only those people that the UK would allow. Experts from the OPCW will return to the UK following a request from the UK Deputy Permanent Representative who invited them to assist the work already taking place – in accordance with Article VIII 38 (e) of the Chemical Weapons Convention. The Ropucha-class landing craft, capable of carrying carry a 450-ton cargo, is parcticipating in the so-called Syria Express, a wide-scale Russian effort to supply the Syrian Arab Army (SAA) with needed weapons, military equipment and supplies to combat militants in Syria. “We coordinated the arrangement under which Russia pledged to make sure, as it were, that the Syrian Army will not cross the ceasefire line established under the 1974 agreement,” Koren said. During Sunday’s edition of MSNBC Live With Alex Witt, the panel engaged in quite a bit of hyperbole when discussing the President’s most recent tweet declaring the press the enemy of the people. Panelist Chris Whipple described the President’s tweet as “outrageous,” “incendiary,” and “dangerous,” adding “it’s only a matter of time if he continues before someone will get injured or possibly killed. You don’t need me to add anything to that. It was hidden in the National Defense Authorization Act, passed December 8th, before Trump took office. One last “present” from Hussein, it seems. #ThanksObama. (a) Establishment.—Not later than 180 days after the date of the enactment of this Act, the Secretary of State shall, in coordination with the Secretary of Defense, the Director of National Intelligence, the Broadcasting Board of Governors, and other relevant departments and agencies, establish a Center for Information Analysis and Response (in this section referred to as the “Center”). Or — to put it simply — they’re going to help the US government distribute information that will support their interests, especially those interests that face scrutiny in other countries. Because they were all part of the Cult, and in on the 16 year plan. You want to know what happened to American Exceptionalism? It was systematically sabotaged by every president from Johnson to Hussein (save, perhaps Reagan). You think 4.1% GDP is big? Pfft. You ain’t seen nothin’ yet. Get ready for 10, 12, even 15% GDP, once #TheCabal is purged from this land and we have sound money once again. Trump is positioned to unleash a torrent of prosperity the likes of which the world has never seen. Get ready, folks, because all this and more is headed our way. 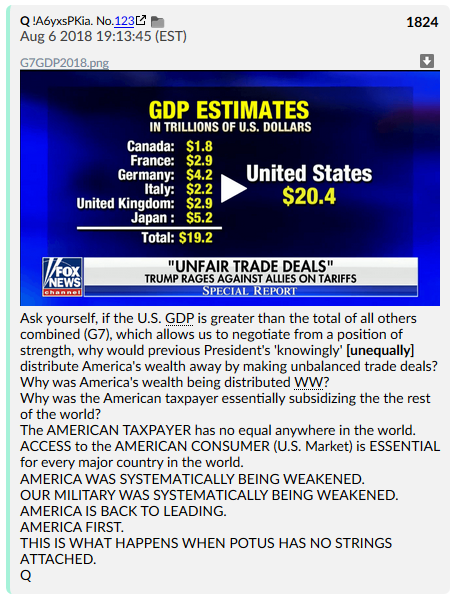 I applaud POTUS and Q and X22report !! How long do we need to keep pretending that they are actually from this planet?